It couldn't be easier! We will even send you labels to ship the cores to us*. By remanufacturing used air suspension parts Arnott is able to keep them from filling up our landfills while providing the highest-quality refurbished products at substantial savings. 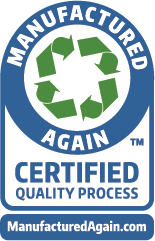 Arnott remanufactures cores using only the highest quality materials and Arnott remanufactured struts come with a Limited Lifetime Warranty. *Listed prices and free shipping for vendors in the continental USA only. International vendors please call. Arnott buys and recycles cores which include the full shock/strut assembly including all intact wiring harnesses/plugs and does not buy air springs alone. Cores with missing or damaged wiring harnesses may not be accepted. All vehicle makes, models and brands are the trademark of their respective holders. * Prices and return label offer valid in the Continental USA only. International vendors please email [email protected]. Canadian Clients: Arnott will send your shipping labels to Arnott's Canadian Distribution Center - Please contact Arnott at +1.321.868.3016 or email [email protected].